← RESPONSIBILITY…one word, express in one hundred words in one hundred days. KNOWLEDGE…one word, express in one hundred words in one hundred days. Knowledge Is The Force Of Foundation Of Life That Give All Round Rest. In The School Of Success Vision Is 10%, Diligence Is 10%, Planning Is 10%, Team Is 10%, Sacrifice is 10% But Knowledge (Know How) Is 50%. The Labor Of Fools Weary Them, For they Do Not Know How (Lack Knowledge) To Go To The City. Understanding Is The Capacity To Believe In Wisdom. Wisdom Is The Acquisition And Application Of Relevant Knowledge. Knowledge Is Gathering Of Secrets And Information As Regards To Life. 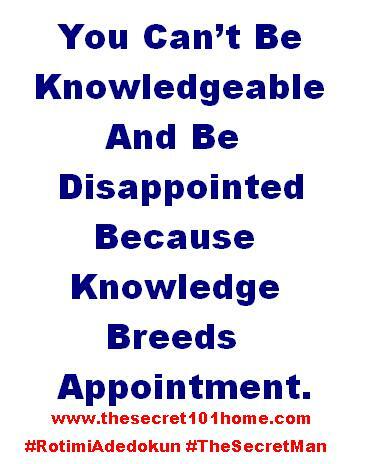 You Can’t Be Knowledgeable And Be Disappointed Because Knowledge Is The Secret Of Appointment. This entry was posted in Life and Time Management, Self Development, The Secret, Vitamin Of The Mind and tagged Bishop David Oyedepo, Ecc 10:15, how to acquire knowledge, Jim Rohn, Knowledge, Pastor E A Adeboye, The Labor Of Foolish Wear Them, The Power Of Knowledge. Bookmark the permalink.